This is sound advice for painting the exterior of any home and a good thing to keep in mind as you express yourself with color and style. Having a home with a striking exterior can be both an asset and source of pride for its owners. Having a home that stands out like a sore thumb on the other hand can cause a rift with your neighbors and can reduce the value of your home when you decide to sell. 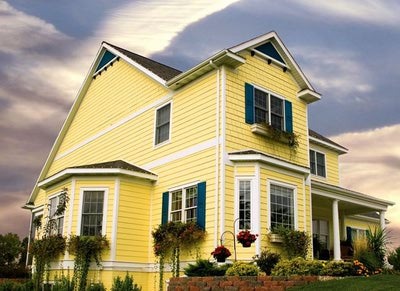 This exterior color sidesteps garish yellow tones, bringing it into the warmer, friendlier range. A clashing or bold exterior paint color can become an issue that impacts an entire community and I have often been called in to give a professional opinion to help resolve an issue. In this case I was asked me for some assistance with to a color dilemma that had some outraged over their neighbors choice of color for their home. Ours is a planned community, and people have recently started painting their houses. I think it’s fantastic – instead of 83 houses the same shade of dull off white, there are some darker greens, burnt oranges, lighter and darker blues. Maybe 5 or 6 of the houses in the neighborhood have been painted different colors. Recently one home (unfortunately, near the entrance to the neighborhood, where everyone could see it) was painted bright yellow. Outraged residents immediately started posting on our neighborhood website that it was “highlighter yellow”, and all our property values would go down. I believe that the only reason it stands out so much is because so many of the surrounding houses have the builder’s beige or off white paint that was applied by the developer en masse 7 years ago. So the question is, how to deal with these people who feel so emotional about the color of other people’s homes. Is there any way to help them alleviate their fear that their investment in their home is threatened by the change in color? You have already hit upon the primary reason that this color created such a negative reaction in your situation. It is not simply the color that people are responding to, since some studies show that people respond positively to homes painted yellow and that they sell faster on average than any other color. In this case, it is that the yellow home seems out of sync in a neighborhood of mostly beige and white homes. Many times a color that would be admired in one setting may be unwelcome in another. If all the homes in your neighborhood were painted in dramatic colors, then the bright yellow home probably would not have caused a stir. Since it is currently only one of a very few homes that are different, it would stand out regardless of the color. However, the fact that it is painted a bright color calls even more attention to this fact. It does seem likely that a fair number of others in the community will choose to move away from the original color schemes and add color to their homes based on what you are seeing already. As more and more homeowners paint their properties this home will not stand out quite so much. While the bright yellow may never blend in it will stand out less among homes that are a variety of colors than it currently does among its white and beige counterparts. I agree that having the homes painted in a variety of colors is much more appealing than the limited palettes most builders use when building home today. Just about any color can work in any community but what it comes down to is finding a version of the color that blends with the neighborhood or stands out in a subtle, unobtrusive manner. As the owners of this home are finding out trying to make a bold, personal statement with a color that clashes with the homes around it may not be well received. With many people voicing their negative opinion of the color choice after the review committee approved it, the homeowners association may react by attempting to restrict colors or limiting choices in the future in some way. While this may appease those concerned in the short-term it could serve to insure that this house remains out of sync with the neighborhood. So any direction set by the homeowners association should be done with the guidance of someone that has knowledge of how to assess the entire community, not just a single home, for the overall best impact of particular color or color combinations. In the meantime, if a homeowner wants to lessen the impact of a particular home in their neighborhood when it comes time to sell, then I can suggest a couple of things that they might do. First inform their real estate agent of their concern and ask that prospective buyers be directed to their home by a route that avoids a direct view of the home to lessen the impact of a strong color. Since the home in is near the entrance to your community this might not be possible. For homeowners bordering the property they could plant a tree or trees with dense foliage to break the visual field up thus reducing the effect of a large area of bright color. One tree or a small grouping of trees can be enough to give the viewer a different impression of the color. Another thing to note is that our reaction to color is very personal and occurs both consciously and unconsciously, so if someone truly dislikes the color it is unlikely that you will change their mind. But know that even when someone strongly dislikes a color that over time as they view it they will have less of a negative reaction. It seems that a bit of time and distance are the only suggestions I can offer to you. I wish there was some magic answer I could provide since you care enough to take an active role in your community. I hope what I have shared can in some way help you maintain harmony among your neighbors. 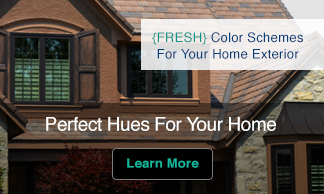 To select colors that allow your home to stand out while still fitting in download FRESH Color For Your Home Exterior eBooks. 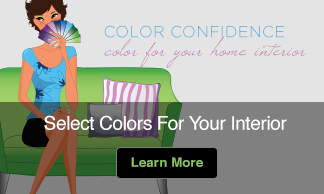 Following my five simple steps you will be able to find the perfect colors for your home. I did not find this article as helpful as I had originally hoped. I was thinking the color expert would suggest a complimentary color to the yellow that the home owners association might politely suggest for their trim…like some version of blue or teal or purple depending on the shade of yellow and it’s opposite color on the color wheel. I’m no color expert but I have studied a little color theory and realize that our perception of color is really relative to what other colors are nearby. The association might even offer buy the paint for this “oddball homeowner” or help them mix it to tone the “highlighter” down a notch and keep it in the same family…maybe go more pastel yellow. It really all depends on the actually shade and hue of yellow, which way (lighter or darker) might help the house not to be such a stark contrast. Another solution might be to suggest some colors for other homes in the neighborhood which might blend in with that home or just go for starker contrast by suggesting complementary colors. This reminds me of the first time I saw all the beautiful colors of the homes in Curacao. The story goes that all the homes on the island were once white and it drove the Mayor a little insane (or maybe it just gave him a headache) so he made everyone paint their house a different color. I don’t really know if it was planned or if it just accidentally became the amazing kaleidoscope of color but that island is an amazing sight to see and especially from the air. It’s awesome to see all the colors side by side but I’m pretty sure they had to force lighter shades because it seems like the entire island is pastel. Anyways, I digress…it’s an interesting problem and I really wish there was a picture of that neighborhood so I could see how a color expert would fix it with a concrete color plan. As the commentor above points out, house colors are also different based on where the house is. You tend to see more bold colors in warmer climates but this yellow is brash, it seems appropriate for almost any part of the US … and I agree it’s the background, the withe & beige houses, that’s making the house pop more than it otherwise might. The town I live in has so many neglected homes and yards, that I would love to see a brightly painted house with neat landscaping – even if it were purple! I guess it’s all relative, isn’t it?